Governor Pat McCrory emerged from his much-publicized meeting with a handful of other governors and President Obama at the White House Tuesday breathlessly declaring that Obama is open to considering waivers to allow North Carolina to crafts its own version of Medicaid expansion under the Affordable Care Act. But that shouldn’t be news to McCrory or anybody else. Nine states, most of them with Republican governors, have already expanded Medicaid with waivers from the feds or have been in discussions with the Obama Administration about waivers for their own versions of the program. Neighboring Tennessee is the latest state with Republican leadership to move forward, with Governor Bill Haslam unveiling a proposal for Medicaid expansion last month. Apparently McCrory had to fly to Washington to figure out that the Obama Administration was willing to work with state officials who are developing their own Medicaid plan. Or maybe he just wanted us to know he was talking tough with Obama. I presented a very strong argument for more flexibility if we even consider Medicaid expansion, so we can have a North Carolina plan instead of a Washington plan, and especially a plan that would encourage more people to get a job or get training before we expand another government program,” McCrory said after the meeting. While it’s too bad it took McCrory much longer than many Republican governors to realize the Obama Administration was willing to work with the states to provide health care for people who need it, at least he seems to finally understand it. There’s also the head-scratching logic that more people will have to get a job before Medicaid is expanded, as if only people who are working need to be able to see a doctor, not to mention the people with chronic illnesses whose lack of access to treatment prevents them from working in the first place. But maybe now McCrory can get on with what he should have done already, following the lead of his Republican colleagues across the country by expanding Medicaid in North Carolina and providing health care coverage for several hundred thousand low-income people and creating thousands of jobs in the process. It is past time. 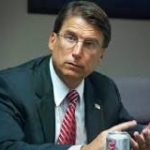 McCrory’s firm grasp of the obvious doesn’t include the needs of the people of NC.